In the fourth of their series of wellbeing events leading flooring manufacturer Milliken invited Neil Shah (founder and Director or the Stress Management Society and best-selling author) to run an ‘excelling under pressure’ workshop. Interior designers and architects are known to be amongst the most stressed workers with tight deadlines, financial pressure and an ultra-competitive environment. • A survey by Architect’s Journal found that 25% of UK architecture students are seeking mental health related treatments. • Nearly 90% of the 447 respondents said they had had to work through the night at some point. Almost one-third said they have to do it regularly. • Architecture ranks fifth in the list of jobs most linked to suicide according to a U.S. study. Invited guests made up of interior designers and architects gathered at Milliken’s Clerkenwell showroom for a workshop designed to build self-awareness, resilience and to empower individuals to recognise workplace stress and tackle stress-related challenges at work through effective coping strategies. Stress guru Neil Shah explained that our typical response of turning to stimulants (such as caffeine, refined sugar, nicotine and alcohol) at times of pressure exasperates the problem. As an alternative he shared breathing techniques and ways to help individuals define and articulate their stress levels. As well as learning practical techniques to help themselves in the workplace the group also examined ways they, as designers, can improve wellbeing and help reduce stress through the spaces they design. 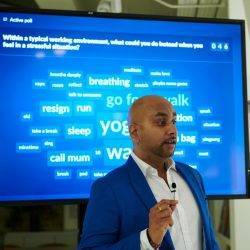 Using Sli.do interactive polling technology the audience was asked: “Is a physical work environment important for wellbeing and mental health?” The response was overwhelming with an exceptionally high majority of 98% agreeing with the statement. Natural light and fresh air were the top picks of elements that can positively impact wellbeing. In a Nationwide study just completed by the Stress Management Society for Peldon Rose 95% of respondents state their physical work environment is important for their wellbeing and mental health. However half say their current working environment doesn’t have a positive effect on their mental health (51%), wellbeing (49%), mood (47%) and productivity (43%). Neil Shah is the author of Amazon #1 best-seller ‘Turning Negatives into Positives – An Introduction to Neurolinguistic Programming’ and ‘The 10-Step Stress Solution’. Neil is also a renowned media personality on the subject of stress and writes regularly for newspapers and magazines including The Guardian, The Times, Men’s Health, Psychology’s Magazine, HR Magazine, Top Sante and The Huffington Post. He regularly appears on television and radio interviews and is now the BBC’s featured expert on stress appearing on BBC Breakfast, BBC Five Live and others. Milliken’s next wellbeing event will take place in January 2019 and focus on nutrition and wellbeing with guest speaker Kate Cook.